Weather will move Friday events indoors; Brigand's Bazaar added Thursday. The rain isn’t going to stop all of Friday's great Pirate Jamboree events. In order to keep everyone dry, the Living History exhibits and artifacts will be moved from the outdoor encampment into the Berkley Barn, located right behind the encampment for FRIDAY only. The Books to be Red Stage has been moved to the Ocracoke Community Center. Food & libation vendors will move to indoor arenas (Ocracoke Community Center and Berkley Barn) – For Friday only. Brigands Bazaar will expand to Thursday (11am – 5pm), Saturday (10am-5pm) and Sunday (10am-5pm). On Saturday, everything will go back to its regularly scheduled locations. Please check facebook.com/BlackbeardsPirateJamboree for the latest updates. 11am: The Kings Rangers muster! Drills: Pike, Cutlass and Long Gun: Cannons fire as we kick off a great festival at the King’s Rangers encampment Wahab House dockside! 3:30 pm: The Pirates invade the encampment! 8:30 pm: Will the Real Blackbeard Please Stand Up? What happens when three men portray themselves as Blackbeard but only one them is the real notorious pirate while the other two are imposters? 8 pm: Tom Mason & the Blue Buccaneers. A wild band of Nashville musicians who dress like pirates and play a rollicking mix of piratical sing-alongs, rave-ups, rock and more. 10 am Springer’s Point Memorial Service for those killed in Blackbeard’s Last Battle. Join with us as the Pirate and Militia Crews march to beautiful Springer’s Point to honor those who perished on that fateful day, Nov. 22, 1718. The Militia’s cannons will kick off the march at Blackbeard’s Lodge. Join in at any point along the route. The Hyde County Tram will operate throughout the Jamboree weekend from 10 am – 9 pm, taking visitors around to tram stops throughout the village. 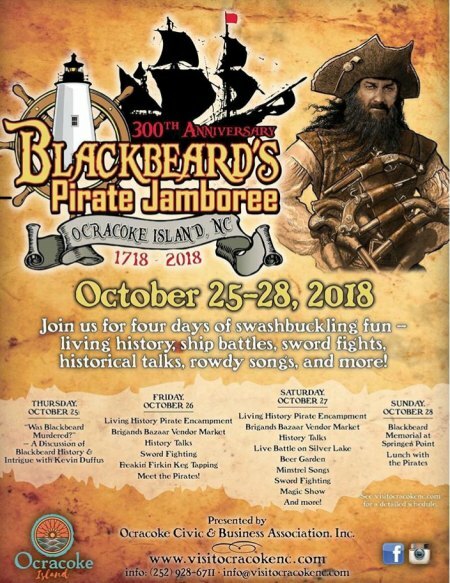 For details about Ocracoke’s Jamboree, visit the events page at www.visitocracokenc.com or facebook.com/BlackbeardsPirateJamboree.